Atomic Light Angel Reviews - Is it a Scam or Legit? 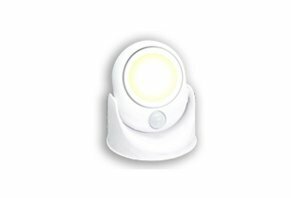 Using a technologically advanced motion sensor, Atomic Light Angel automatically turns on and off, with bulbs that can last 100,000 hours and indoor/outdoor functionality. Atomic Light Angel is a cordless LED that uses a super-adhesive strip to stick anywhere and light your path, regardless of what Mother Nature throws at it. It also comes with a lamp head that swivels 360 degrees back-and-forth to direct this light where you need, motion activation that automatically turns off after 30 seconds, and COB LED panels that shine at 460 lumens and last up to 100,000 hours. Simply peel and place anywhere you need, whether your front door, back door, side entrance, or in your shed or attic. Are you looking to figure out if Atomic Light Angel really will deliver the perfect amount of light exactly where you want it? Keep reading, and we'll quickly cover everything we learned during our research. How Do Motion Activated Models Like Atomic Light Angel Work? Infrared – Monitors changes in heat generated by humans, animals, or vehicles. Radio Wave – Sends out microwave signals to detect changes in the field as objects move into view. As an advertised “technologically advanced motion detector,” which of these will you find in Atomic Light Angel? We’ll dive into more detail in a second, but let’s first discuss the price and the company behind it. How Much Does Atomic Light Angel Cost? Bulbhead, a division of Telebrands, provides a 30-day satisfaction guarantee on all purchases, less S&H, regardless of the quantity ordered. If necessary, customer service can be reached at 855-668-1655. What Do We Know About Atomic Light Angel’s Manufacturer? We know a lot about Telebrands, since they’re the largest and longest running As Seen on TV company in the industry, and because we’ve reviewed hundreds of their products over the years, including popular options like Bavarian Edge, California Charcoal, Ped Egg Power, and of course, the Atomic line of lighting products. With 28 negative reviews and more than 320 closed complaints as of 3/7/18, Telebrands held an F Better Business Bureau rating. Most of these appeared to revolve around lower product quality than expected and difficult customer service experiences. While we didn’t test any of these models ourselves, the biggest differences seem to be Atomic’s 360-degree, back-and-forth swivel functionality (the original only swivels up and down), as well as its COB LED panels that promise to shine at 460 lumens (no brightness measures are listed for the original model). How many LED bulbs does Atomic Light Angel contain? Is there any way to adjust the length of the automatic shutoff? What happens if you need to place the light in another location? Is the sticky backing reusable, or do you have to add more? What kind of batteries does it use? How long will they last before needing to be replaced? Will you have to un-stick the entire light from its surface in the process? What type of motion sensor does it use? How far away does the motion activation work? What pattern does it detect (straight ahead, 90-degree, 180-degree, etc.)? Are There Other Models Like Atomic Light Angel? We’ve covered a lot of territory in a relatively short time here, so let’s bring everything together and come to a conclusion about Atomic Light Angel. When purchasing an outdoor security light, A Secure Life recommends looking for models that use LEDs, since they can last much longer than incandescent versions and can cost much less to operate. However, you’ll have to be OK with the blue hue their lights emit, which largely comes down to personal preference. A Secure Life doesn’t emphasize a specific brightness, although they point out that a 60-watt incandescent bulb puts out about 800 lumens. So, you might expect a model like Atomic Angel to provide about half as much light, which means it will only light up a very small backyard (following the claim made in the commercial). On the flip side, although Atomic Angel seems to put out meaningfully more light than some of its close competitors, keep in mind this also means it could go through batteries much faster. Lastly, the author recommends looking at security lights with at least a 40-foot motion sensor range. Bringing it all home, based on what we learned from the website and commercial, Atomic Light Angel seems to come with several useful features (360-degree rotation, 460-lumen brightness, long-lasting LEDs, the ability to stick anywhere, etc. ), along with a competitive price. Although, customer support wasn’t able to answer any of our questions regarding additional specifications. If you feel like giving Atomic Light Angel a try despite some of these missing details, Telebrands seems to stand behind it with a 30-day refund policy, so you might not be out much more than return S&H charges if you give it a try and end up dissatisfied. Write a Review for Atomic Light Angel!